Washington, DC - If you think the feuds among the Great Houses of Westeros get intense, consider the dinner table discussions about student loan debt. It’s not just taking a toll on the home front. Experts report that the $1.4 trillion debt burden carried by 42 million Americans is affecting workplace productivity, too. But at a time when consumers need accurate information, opportunistic outfits fly in like Daenerys Targaryen’s dragons with false promises of debt reduction or forgiveness. The FTC – along with 11 states and the District of Columbia – just announced Operation Game of Loans, a crackdown on deceptive student loan debt relief operators that allegedly took in illegal upfront fees in totals that would have astonished even the Iron Bank of Braavos. The FTC and AGs filed a total of 36 actions against dozens of defendants charged with grabbing more than $95 million in illegal fees from consumers struggling to make their next student loan payment. Often pitched on social media, the defendants’ ads struck similar deceptive chords – “Get rid of student loan debt,” “$0 monthly payments,” and “We can . . . solve your student loan problem. 100% guaranteed!” To bolster their credibility, some ads suggested a false affiliation with the Department of Education. But the only thing “100% guaranteed” was that the defendants stung cash-strapped consumers for hefty upfront fees and then didn’t honor their promises. A1 DocPrep, Inc. The FTC says the California-based operation, which claimed to be affiliated with the Department of Education, took millions from consumers struggling with student debt. But rather than delivering on the promised relief, they allegedly spent the cash on cars, jewelry, and nightlife. American Student Loan Consolidators. According to the complaint, the Florida company took in more than $11 million with false claims of loan forgiveness, reduced monthly payments, and lower interest rates. What’s more, the FTC says the defendants tricked consumers into believing that the illegal upfront fee of as much as $799 was going toward paying off what people owed. Alliance Document Preparation. The FTC lawsuit alleges that the Los Angeles outfit charged upfront fees totaling more than $20 million without delivering on their claims to consumers. The defendants operated under 20 corporate names like United Legal Center, Alumni Aid Assistance, Post Grad Services, and Academic Aid Center. Student Debt Doctor. The FTC alleges that the Florida company wasn’t what the doctor ordered for consumer struggling with student loan debt. Claiming that consumers could get loan forgiveness in as few as five years, the defendants used social media, email, and telemarketing in both English and Spanish to take in more than $7 million. Student Debt Relief Group. The FTC says the LA-based company used a bogus affiliation with the Department of Education to collect more than $7 million in illegal upfront fees. In addition, the complaint alleges that the defendants charged consumers as much as $1,000 to apply for free government programs. Once consumers started to complain, they allegedly changed their name, but not their business practices. The complaint also charges that they used consumers’ Social Security numbers and FSA IDs to hijack their accounts. Why should student debt relief deception matter to your company? Chances are you have employees struggling to make their monthly payments. Money diverted to bogus debt relief operators puts their dream of financial security ever farther away. Here are steps you can take to lend a hand. Share legitimate sources of information. Arm your staff members with accurate information from StudentAid.gov/repay about repayment and forgiveness programs available to them at no cost. 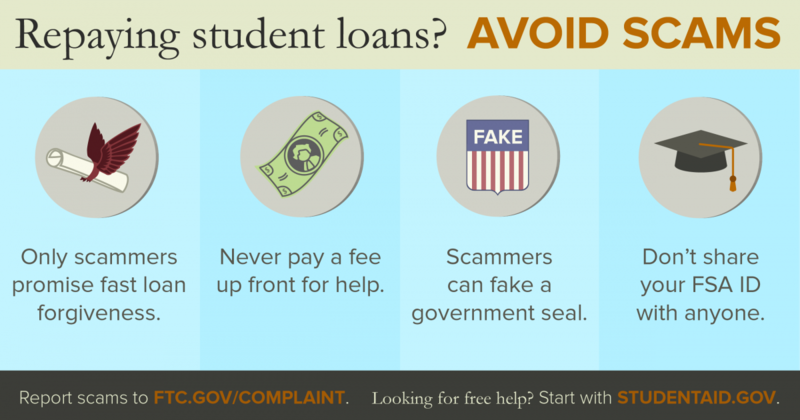 In addition, the FTC has updated advice on how to spot a student loan debt relief scam. Enlist your HR team to assist staffers who could be targeted by student loan scammers. Whether it’s a printout of brass-tacks tips on a bulletin board or a one-minute mention at the next staff meeting, it makes good business sense to have your human resources professionals serve as a conduit for scam-fighting guidance. If an ad promises fast loan forgiveness, it’s a scam. Genuine options are available through the Department of Education or the loan servicer – and they’re free. Never pay an upfront fee for debt relief services of any kind. Scammers often fake an affiliation with the Department of Education. Investigate the source of the information you receive. Don’t share your FSA ID with anyone. The FTC also has advice for companies in the student loan debt relief business. The Telemarketing Sales Rule has specific provisions to curb deceptive and abusive practices in the debt relief services industry, including when the debt is a student loan. The Rule applies not just when companies make outbound calls to prospective customers. It also applies when consumers call companies in response to ads or other solicitations. You’ll want to read the Rule for the specifics, but there are three important takeaways. First, it’s illegal to charge upfront fees. Until you have settled or otherwise resolve a customer’s debt, you can’t collect so much as one thin dime. Second, before people sign up, you must clearly disclose key facts about your services. Just for starters, that includes how much it will cost, how long it will take to get results, and the negative consequences that could result from using debt relief services. Third, under both the TSR and the FTC Act, it’s illegal to make false or unsubstantiated claims about student loan debt relief services. Before making any objective representations, you must have solid evidence in hand to support what you say.